During the 2016 presidential election, Arjun Singh Sethi became worried about the state of hate in America. There was a wave of assaults, vandalism and attacks on places of worship. People across the country, he saw, were being targeted on the basis of who they were and what they believed. Something important, and deeply disturbing, was happening, yet he felt the issue wasn’t getting the attention it deserved. Amid flickers of hope, Sethi paints a bleak, often dispiriting, picture of how hate manifests itself and leaves a path of emotional and physical destruction in its wake. It’s a hard read, but an essential one for anyone looking to understand America in 2018. In this week’s Hate Report, we talk to Sethi about how the criminal justice system is failing survivors, the invisible victims of hate and the discrimination he personally experienced while researching the book. Can you tell me about some of the people you profiled in your book? Majors ran over Khalid’s mother in his car. She sustained numerous injuries and was hospitalized for a long time. The suspect was arrested. Because of the suspect’s history of harassing and committing an act of hate violence against the family, the Jabaras requested he be kept in custody and that he not be allowed to post bond. But, because a new assistant district attorney was appointed to the case, what ended up happening was the Jabaras received a call one day saying that Majors was going to be released on bond. There wasn’t anything they could do because it’s very rare for a judge to reverse a decision to allow a suspect to post bond. This suspect, who had run over Haifa Jabara, was released to return to the home next door to the the family he terrorized. Khalid was in the house and heard some commotion outside. Majors was shooting a gun inside his house. So Khalid called the police. This is the day Khalid died. He called the police and he told them they need to come immediately. The police knocked on the door of the neighbor. But he didn’t answer, so they didn’t do anything. They went back to Khalid and they said, ‘He’s not answering the door.’ Khalid implored them to enter the house, but they refused. Minutes later, Majors came to Khalid’s home and murdered him on his front doorstep, the doorstep where the police were just moments earlier. The Jabaras feel, and I feel, that had Majors been black or Latinx, they would have kicked that door down. But because he was white, they didn’t. In basically all of the cases in your book, the victims connected their attack to a long-standing history of their own communities’ experiences of racism. How did victims fit these specific incidents of violence and harassment into the larger experience of hate minorities regularly deal with? America has a tragic history that we still haven’t reconciled. Our nation was built on a hate crime – the decimation and destruction of Native communities. And furthered by additional hate crimes and atrocities – including slavery and Jim Crow. Our Constitution described black folks as three-fifths of a person and didn’t give women the right to vote until 1920. Some want to forget or rewrite this history, but we have to confront that terrible legacy. That’s the history that folks are remembering. Whether you lived 400 years ago or during the Obama years, hate has been a fixture for our country for as long as it has existed. There’s one case you write about, Sarath Suong, who said he didn’t reach out to the police after his advocacy group’s office was vandalized. He didn’t want to engage with law enforcement. He felt that it was part of an infrastructure built to oppress him and didn’t think that they would do an effective job of seeking justice. Was that sentiment common? Suong is the executive director of the Providence Youth Student Movement. He came into the office one Monday morning and saw equipment had been rearranged, knives were stabbed into the desk and a noose was hanging from the ceiling. They made the extraordinary decision after that incident to not call the police. They made that decision because they are an abolitionist organization, which means that, by their very principles, they believe organizations like Immigration and Customs Enforcement and law enforcement should be abolished because they are no longer in service of communities. From their community’s vantage point, it would have been a contradiction to call the police. Why would they call a body that is otherwise responsible for so much of the violence that they experience? What they did in the aftermath was put out a statement. All of the members took self-defense classes. They built up the neighborhood watch program. They created a buddy check-in program for all of the youth and staffers at their organization. They also decided not to install cameras because they believe that they are already a watched, surveilled community. They thought it was important for them to have some space where they don’t experience that type of surveillance. In determining how to respond to a hate crime, we have to be guided by the survivors and the impacted community. There is no one-size-fits-all answer. But I do think that local communities and activists are increasingly having conversations about the role of police when it comes to hate crimes. In your book, you talk about disability, which is something that isn’t regularly discussed in the context of hate. How are disabled people being affected? Folks with disabilities sometimes say they’re the world’s largest minority because they span every race, faith, sexual orientation and gender. They are an important demographic, but they’re disenfranchised because of ableism and their limited political power. Disabled folks told me that, ever since the election, they’ve experienced an uptick in bullying and hate. Sometimes it’s increased staring, ridiculing or folks following them around. Other times it’s microaggressions. People don’t want to wait that extra minute for a person with a disability to board a bus, cross the street or go about their daily business. In other cases, we’ve seen a spike in theft and robberies committed against persons with disabilities. They’ve seen an increase in online bullying, which is especially important since disabled people often use the internet for social interaction. They’re undoubtedly impacted in this moment and their stories are often excluded. That uptick is connected to something present in every incident you delve into in the book, people linking their experiences of hate very directly to Trump and the climate of xenophobia he’s unleashed. Is that something you were specifically asking people about? Or was that something people were bringing up on their own? No matter where I went, no matter who I met with, almost everyone said something similar. The 2016 campaign and subsequent election of Donald Trump emboldened, empowered, facilitated and legitimized the very worst forces in America – racism, xenophobia, Islamophobia, anti-Semitism, sexism. There was a nearly uniform belief that hate nowadays is more visceral and widespread than many of us could have imagined just a few years ago. In the beginning of your book, you talk about some of the hate that you personally experienced while traveling around the country doing this reporting as a minority journalist. Can you talk about those experiences? I’m a Sikh American. 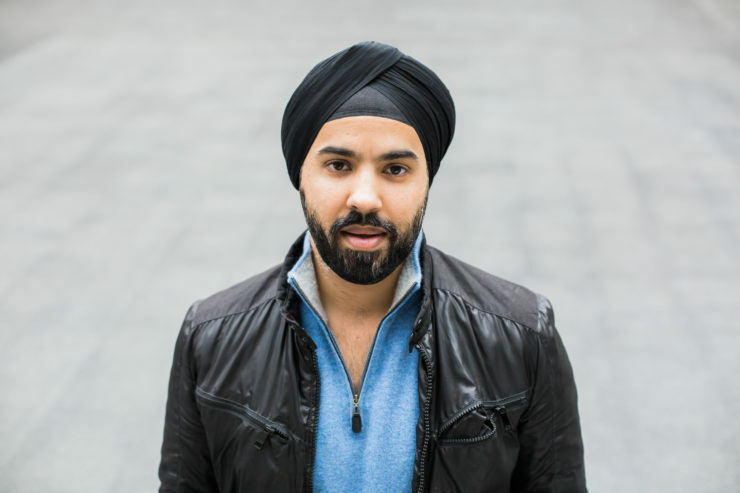 Many Sikh Americans can be identified by their turbans and beards. Throughout my life, I’ve experienced different forms of harassment and profiling. When I was in Tulsa, a man in a pickup truck was tailgating me. Maybe I was driving slow, I don’t know. He pulled up next to me and, when he saw who I was, he started mocking me and yelling at me. He was putting his hands around his head like imitating my turban. I immediately pulled off the road because I didn’t want to engage with him. When I was at American University (interviewing the school’s first black student body president, who experienced so much racist harassment she had to step down from the position), I was on the campus shuttle and I asked somebody for directions to a building. They intentionally misdirected me. I know because I then saw that same person enter the same building as me 20 minutes later. That all happened just in the context of working on this book. In terms of solutions, what’s your perception of hate crime laws? Are they effective in dissuading people from carrying out these attacks? Hate crime laws are important, but not because they add time to already lengthy prison sentences. I think mass incarceration is a human rights atrocity. I believe that sentences in this country are already, in general, too long. The real value of hate crime laws lies not in lengthy sentences and exacerbating mass incarceration. They’re valuable because hate crimes have a deep and long-lasting impact on survivors, communities and the public at large. It’s critical for authorities to treat hate crimes differently from other crimes and to show vulnerable communities and the public at large that hate will not be tolerated. Survivors often told me that calling bias-motivated crimes “hate crimes” allows us to see these crimes as interconnected, and often rooted in white supremacy, rather than as isolated events. In doing so, it provides an opportunity to discuss the origins and proliferation of hate. Hate crime laws also allow judges and other decision-makers to prescribe restorative sentences. We’ve seen judges, in the wake of hate, require offenders to learn about and volunteer with targeted communities. That doesn’t happen if you don’t have hate crime laws. Looking forward, do you see other reforms that could be done at the federal level to make this situation better? Local officials must ensure that survivors have access to basic resources, including health care, mental health support and legal counsel. They should appoint case managers from targeted communities to help survivors meet these needs and should set aside rapid-response funding so that they can address acts of hate when they occur. Legislators should also convene open hearings where survivors and community leaders can share their stories and provide input on best practices to curb hate. Survivors and their communities must be centered in both local and federal policy discussions. On the federal side, future administrations should make the elimination of hate crimes a national priority. After President Clinton in the 1990s declared the investigation and prevention of church arsons a national priority, the number of attacks on African American churches dropped by 53 percent. Congress should also make hate crime reporting mandatory, rather than voluntary. Better data will allow us to see who’s being targeted, where and by whom. Hate will continue in America until we dismantle domestic and foreign policies that target and stigmatize vulnerable communities. Profiling, police brutality, surveillance, immigration raids and the never-ending “war on terror,” for example, treat communities of color and other marginalized groups as inherently suspect. These policies existed long before Trump and have intensified under his watch. As long as the government puts a target on our back, we will never be free.